Purchase the AIMS Index_Rebuild Creator One registration is used for A5v5 through v12. The default is "All". The function also accepts optional commands to run without the prompt or to update only selected tables - see the function's bubble help for details. Hint: It was created as a function so arguments could be set to run it, for example, from the Autoexec script without the prompt as described above or for updating indexes for specific tables before running critical operations - Index_Rebuild_Auto(.F.,.T.,"Customer_Info"). Multiple tables can be updated by using a crlf list of table names. The difference between the Index_Rebuild_Auto() function and Alpha Five's built in <tbl>.Update_production_index() function is that the built in function will only update existing indexes to their current definition - it will not restore any indexes that are missing or that have been modified from the original definition. To install the AIMS Index_Rebuild Creator, simply run the installation routine. This installs the addin to the Addins_Installed folder of all full versions of the Alpha5 program that are installed on your computere (A5 versions 5 and above). - To build a new Index_Rebuild_Auto() function, simply go to the Interactive Window and type the function name - Create_index_rebld_auto(). - To let a user rebuild indexes, simply put the Index_Rebuild_Auto() function on a button. - To rebuild an index or indexes automatically (without user intervention), simply add the Index_Rebuild_Auto() function to the appropriate script and set the desired options - see the bubble help for option details. Added new Create_index_missing_chk() function. Like the original function, this function creates a new function which can be used to very quickly check for the existance of all index names. It does not validate the index itself - only that the name still exists. It is intended only as a debugging aid if you have problems with missing indexes. In one test it checked index names for 122 tables in 1.1 seconds. It can also check index names for any list of tables - which means it can check, for example, 5 tables used in a set in less than 1/4 second. Removed option to rebuild "developer indexes only". There were too many potential negative consequences with this. Revised check for shadow tables to handle the revised file sizes in v11. Added check for Active Link tables. Modified PleaseWait dialog to show the number of indexes being updated. 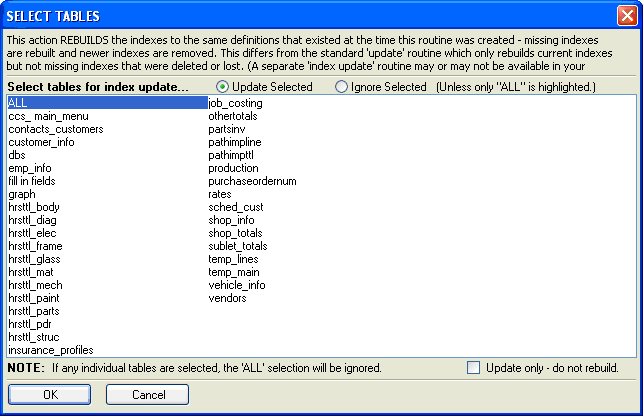 Modified "del_all_indexes" routine to handle open tables and specific "skip/update" selections. Modified "not_exclusive" routine because of error message changes in newer versions of Windows. Added check for shadowed tables in "del_indexes" routine. Fixed problem with the "Compare Indexes" option. If the user chose the option to "Rebuild to Current Definitions", it still rebuilt to the new definitions. Modified to ignore the new "__A5_Record__" indexes in v9. Any errors that occur when running the Index_Rebuild_Auto() routine will now be stored in a text file named Index_Rebuild_ErrorLog.txt for future reference. Updated to ignore the new "__A5_Record__" indexes in v9. Fixed problem with the "Ignore Selected" option. If a table such as "Internal_Parts" was selected as a table to be ignored, any other table that was a substring of that table, such as "Parts", was also ignored. Modified the 'File not exclusive' error trap to handle the new error text in Alpha. This re-establishes the ability to skip tables that are being used by others and continue with subsequent tables. Modified the selection process so that selecting a table that ends with the characters "all" will not cause the selection to change to "All" tables. Modified this install routine to work *correctly* with A5v9. Due to limitations created by Alpha, this requires that the person installing this addon must have permission to install to, and create if necessary, the Addins_Installed folder under the A5v9 executables folder. In many cases, especially with Vista, this will mean adminstrator privileges. Modified install file to work with A5v9. Added routine to make it optional to allow users to "compare index definitions". (See version 1.02) This was done to save 20-30% of the characters when building indexes for very large applications - especially in A5v5. Fixed Variable "i" not found error introduced in last update. Added version number to header of dialog. Dimensioned (DIM) all variables and eliminated global variables to avoid errors when run with other programs that use the same variable names. Fixed font setting that caused an error when the "Warn If Different" option was set and the existing indexes were different than the original indexes. Updated install routine to work with Vista. Minor modifications to make it work in A5v8. Added ability to compare existing indexes with original index list and either rebuild original or just update the current production indexes. This comparison is done table by table. To use this option, set the Allow_comparisons option to .T. Modified routine to build much larger scripts resulting from more tables and/or indexes. This included adding a horizontal scroll bar for the list of tables in the dialog window. Changed routine to correctly handle index names with quotes in them. This is not generally good naming practice but if a set is linked with on a simple value like "A" (including the quotes), then the system will assign the name "A" (including the quotes) to the index.